Two necks of music - portrait ? I had to do a portrait of two sisters once. I happen not to want to simply make a direct portrait but instead I wanted to do something creative. The impression I had of the two sisters was that one of them seemed to me to have a 'Guitar-personality' while the other one had a 'Violin-personality' ( I mean in the context of music). 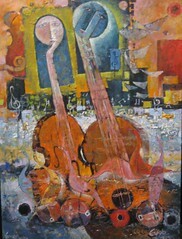 a type of Abstract painting where brushstrokes exhibit control over emotion and focus on inner energy and contemplation, creating a lyrical and intellectual quality to the painting. But anyway, let me tell you a bit about this painting. The blue face and hair is meant to create universe and the circle is meant to create unity. The strings, the birds and the floating papers are meant to represent the gradational tone of musique that is meant to be felt. The circular people close to the box of the guitare are meant to scream - as portrayed by the circular shape of their open-mouth. Note that the shape of the hole of the guitare is similar to that of the head of the people - that is where the sound of the musique comes out and that same form is meant to shape the people to give out sound in harmony with the guitar and the violin.